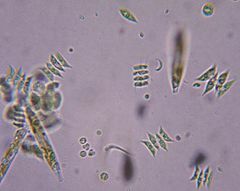 Green algae are microscopic protists. One can find them in all sorts of natural water: salt water, freshwater and brackish water. The group is less used in classification today. Although most are descended from a common ancestor, some are not. Some of their descendants, the land plants are not included in the group, so the group is not monophyletic. A growth of the green seaweed Enteromorpha on rock substratum at the ocean shore. Some green seaweeds, such as Enteromorpha and Ulva, are quick to utilize inorganic nutrients from land runoff, and thus can be indicators of nutrient pollution. Green algae Facts for Kids. Kiddle Encyclopedia.